Hello everyone and welcome back to my blog! Today’s review is of a book that I’ve recently finished (which is something totally new as I’m usually behind on reviewing backlist books). And I totally adored this book so without further ado let’s start with my review! This book was just WOW! I did have some troubles getting into it but in the end, I’m glad that I continued reading it! First of all the world building was amazing. It may sound or even be similar to other worlds in the fantasy genre but it still felt unique to me. In my life, I’ve read a lot of fantasy books and I’m rarely ever bored. Same here. After getting myself into the book and imagining that I’m accompanying Kate and Corwin in this adventure, the book was sold to me and now I’m a big fan of Onyx & Ivory. Which is not cool, because now I want to read the sequel. And that’s absolutely not okay. I’m broke guys, I can’t keep buying more books. LIAR! I completely fell for the for the trap and believed every word that character said. So be careful! Arnett really had the capacity to make us like her characters and be heartbroken afterwards. Why can’t people stay good when you think that they are nice? The pairing was exactly how it has to be. I’m not sure if I can make this clearer but the characters had a chemistry that was felt through the lines of the author. It felt real. When they were heartbroken you were as well. t was authentic and not forced. So I can officially say that the romance was okay. It may not have been needed but it was totally fine. I don’t even have anything bad to say about the romance! And last but not least can we please talk about the fighting scenes? Especially the ones with Kate they were badass. I definitely want to see more of Kate and Corwin in the future. When can I hold book two in my hands? Because I have a feeling that I’m getting very impatient. Kate of course. Signe and Dal as well. But Kate was by far my favorite character in this book. Overall I’d recommend this book to every fantasy lover out there. Try it, it really is amazing and there are things happening in Onyx and Ivory that you don’t even see coming. I swear! I was speechless. Mindee Arnett, I’m ready for book two! And that was everything for this review! How about you? 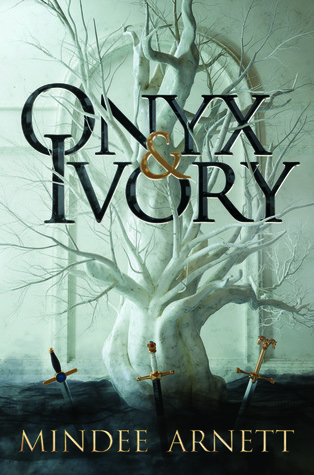 Have you read Onyx & Ivory? Or do you want to read it in the future? Please let me know in the comments below! The cover and synopsis come from their respective Goodreads page. This book has been on my TBR for so long! Glad you enjoyed it. I loved your review! I hadn’t heard of it but the moment I saw ‘Wilder’ I was like ‘I could totally like this’ I’ve added it to my tbr, and your review was really fun to read (also appreciate the Waterstones link! ), again, great review!